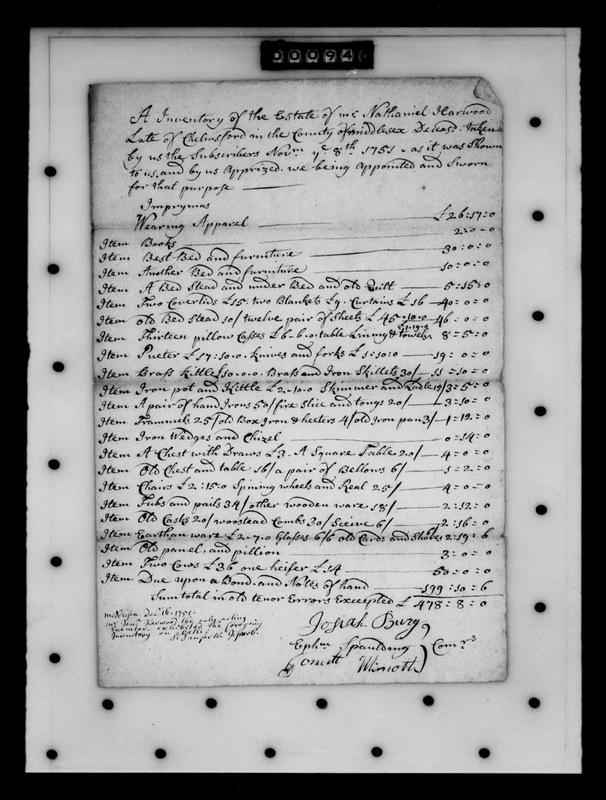 Genea-Musings: Amanuensis Monday - 1751 Inventory and Account of the Estate of Nathaniel Harwood (1669-1751) of Chelmsford, Mass. 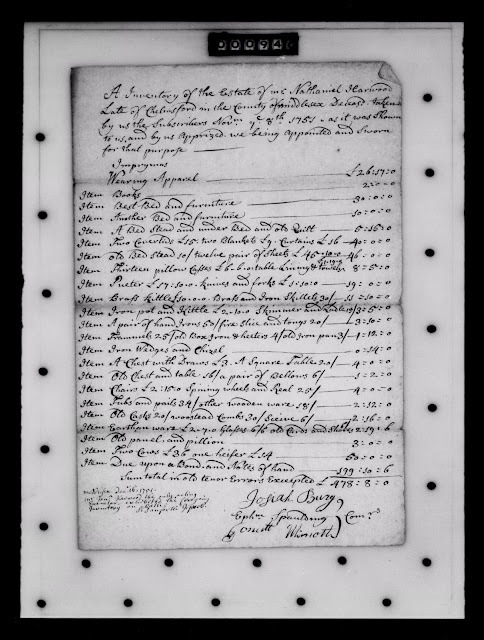 Amanuensis Monday - 1751 Inventory and Account of the Estate of Nathaniel Harwood (1669-1751) of Chelmsford, Mass. 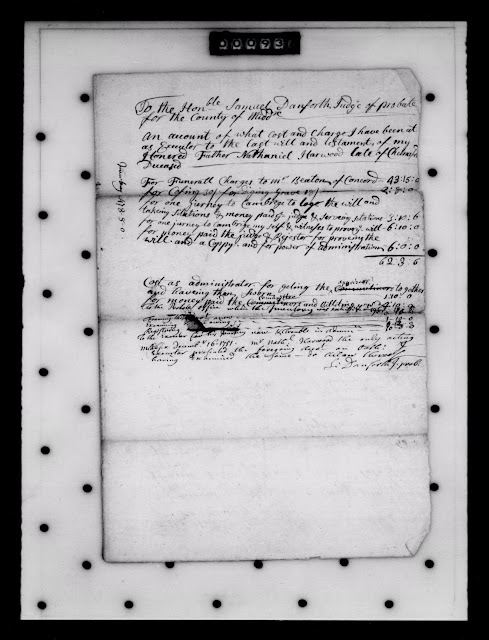 "Middlesex County, MA: Probate Papers, 1648-1871," digital image, American Ancestors (http://www.AmericanAncestors.org : accessed, 26 November 2016), Probate packet No. 10629, Nathaniel Harwood estate, sheet 8 of 9, Inventory, estate probated 1751.
having Examined the same – do Allow thereof. "Middlesex County, MA: Probate Papers, 1648-1871," digital image, American Ancestors (http://www.AmericanAncestors.org : accessed, 26 November 2016), Probate packet No. 10629, Nathaniel Harwood estate, , sheet 4 of 9, Account, estate probated 1751. The estate of Nathaniel Harwood had an appraised value of £478:08:00 (pounds:shillings:pence, with 12 pence per shilling and 20 shillings per pound). The Account of the charges for probating the estate, as calculated by the executor, Nathaniel Harwood (son of Nathaniel Harwood), totaled £ 80:15:06. According to Google Maps, it is about 28 miles from Chelmsford to Cambridge, and about 12 miles from Chelmsford to Concord, using current roads. Nathaniel and Mary (Barron) Harwood are my 7th great-grandparents, through their daughter Elizabeth Harwood (1701-1739) who married Jonas Prescott (1703-1784), and through their daughter Elizabeth Prescott (1734-1812), who married Zachariah Hildreth (1728-1784).